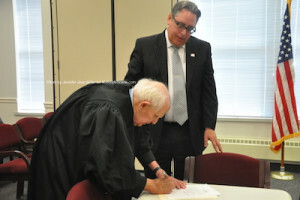 John D. Williams is sworn in as Sussex County's Counsel by the Honorable Judge Frederic Weber. Heidi Weber holds the Bible for Williams. Photo by Jennifer Jean Miller. 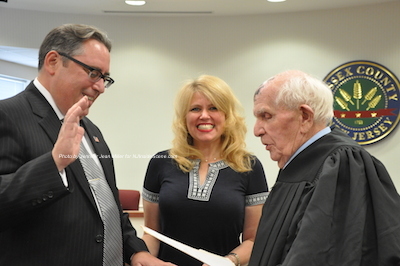 NEWTON, NJ – John D. Williams was officially sworn in as Sussex County’s Counsel on Wednesday, July 1. The Honorable Judge Frederic Weber swore in Williams at the event and also swore him in earlier in the week on Monday, June 29 as the President of the Sussex County Bar Association. Williams was sworn in at the Freeholder Meeting Room with a small group present, including Sussex County Freeholder Deputy Director Dennis Mudrick and Freeholder Richard Vohden, family and friends. The Honorable Judge Frederic Weber signs after swearing in John D. Williams. Photo by Jennifer Jean Miller. 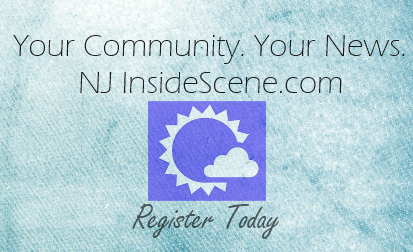 Williams, a Vernon attorney, was chosen via a vote with the Sussex County Board of Chosen Freeholders on June 17 by a 4 to 1 vote, with attorneys Gary Kraemer and Kevin Kelly also vying for the position. Though Williams’ role as county counsel officially began on July 1, he started as special temporary counsel after he was voted on. Others changes at the county level include Stephen Gruchacz, who has additionally become the county administrator and Rob Makis the county’s CFO.